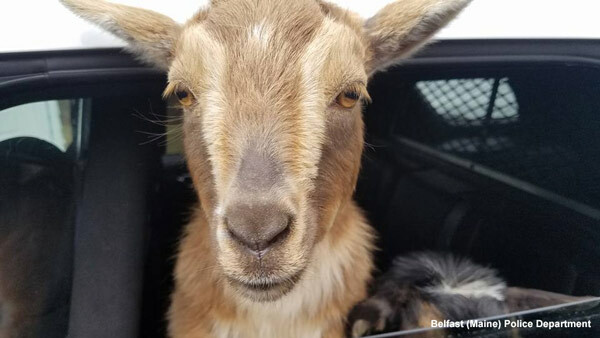 BELFAST, Maine -- Police in Maine have picked up some adorable intruders after two miniature goats escaped from their home and wandered the streets. A Belfast police officer responded Sunday morning to find the pygmy goats in a woman's garage. They had been snacking on cat food. Officer Daniel Fitzpatrick used a cat leash to lead them into his squad car. The trio drove around looking for the goats' owner as Fitzpatrick fed them carrots and celery. Belfast is a seaport town about 45 miles (73 kilometers) east of Augusta. The daughter of the goats' owner saw Fitzpatrick's Facebook post and picked up the pair, named Louis and Mowgli - but not before Fitzpatrick snapped a selfie with the duo.